The Lord & Burnham line of greenhouses has been continually manufactured since 1849. Frederick A. Lord and his son-in-law, William A. Burnham formed a partnership and incorporated in 1883 as Lord’s Horticulture manufacturing company. In 1890 the name was changed to Lord & Burnham. Arcadia GlassHouse Inc. acquired the engineering plans, tooling, copyrights, trademarks and assets for all Lord & Burnham residential greenhouses in 2018. We are manufacturing the original designs with some upgrades for strength and energy efficiency. Lord & Burnham is Back! Early greenhouses were made of cypress wood and iron or steel. 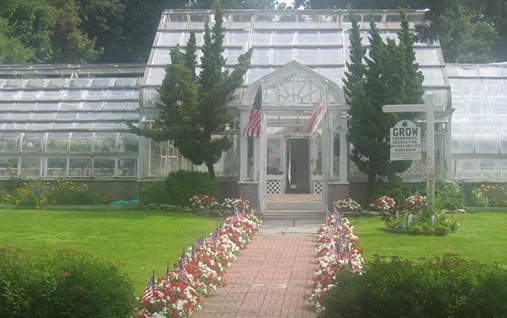 Experimentation with aluminum as a material for greenhouse construction was started as early as 1932 when the U.S. Botanical Gardens in Washington, D.C. were built. However, it was not until 1955 that greenhouses with exterior members of aluminum had reached a point where they were competitive with wood construction. The Orlyt line of hobby greenhouses was introduced in 1939 and redesigned in 1954 with aluminum. We continue to manufacture this line of residential greenhouses.